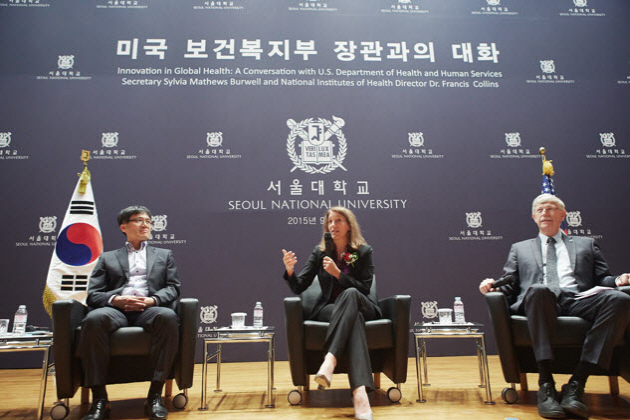 The Office of International Affairs (OIA) welcomed the U.S. Department of Health and Human Services (HHS) Secretary Sylvia Mathews Burwell and National Institutes of Health (NIH) Director Dr. Francis S. Collins on September 8th, 2015 to speak about their contributions and new initiatives regarding global health. 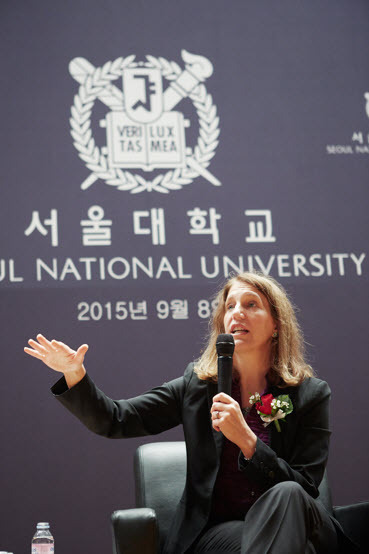 The lecture was held at the Seoul National University Cultural Center. The talk, titled “Innovation in Global Health: A Conversation” with the guest speakers, sought to focus on the future involvement of students and included a thirty minute Q&A session. Sylvia Mathews Burwell, who was sworn in as the 22nd Secretary of HHS, has led large and complex organizations across the private and public sectors. Burwell focused on the importance of public health reaching a global scale in today’s society where epidemics quickly spread into pandemics and international cooperation is becoming a necessity. She drew quick understanding from the audience with the specific examples like the Middle East Respiratory Syndrome Coronavirus (MES-CoV) and Ebola virus disease (EVD). Such cases require the expanding role of public health officials, Burwell recounted, because of its lasting effects both socially and economically. Dr. Collins, M.D., Ph.D., agreed on Burwell’s point about public health’s global operation. Dr. Collins is a physician-geneticist noted for his landmark discoveries of disease genes and his leadership of the international Human Genome Project. He now oversees the largest biomedical and clinical research in the world at NIH. Collins highlighted the significant partnership between South Korea and the U.S. Interestingly, he revealed that South Korea is a leading partner in NIH’s recent, major projects. He showed enthusiasm for working with students and his readiness to not only teach but also learn from them. To a student’s question regarding the near impossibility of becoming an expert in multiple fields of study in addition to administrative affairs, Burwell and Collins stressed the importance of both the hard sciences and public health. Collins, as a research scientist, spoke of his role to provide officials like Burwell with the most up-to-date knowledge in his field so that appropriate actions can be taken with the most factual counsel. Burwell, while praising Collins’s expertise in biomedical research, reaffirmed her part in staying knowledgeable and updated about the scientific side of the issues and not just getting caught up in the bureaucratic facet of matters. And as mentioned above in the speakers’ comment about cooperation between both the hard sciences and public health, Burwell mentioned the equally relevant, biological evidences pointing toward the different types of health care the government should take into consideration, which Collins’s research could yield. The next student asked what measures were being taken in the United States (U.S.) for the continuously diversifying population and the evident discrepancy in the distribution of health care. Burwell described how the U.S. was taking steps toward attending to the minority population. Steps included scheduling and making actual visits to minority families’ residences and making sure their concerns were being heard. Collins also voiced his disappointment with the current research environment and how it is not an authentic reflection of the U.S. demography. He explained how his vision of a global effort toward reducing health-related issues can only come true with the combined efforts of representatives of various groups and their distinct contributions, a vision which is not difficult to achieve, and according to his estimates, should be achieved in five to ten years. Near the end of the lecture, the question, which perhaps was on the minds of all the students in the audience who were interested in entering the field of biomedical research as well as public health, was asked: How can we become successful in what we do? Burwell’s response could not be more accurate. “Follow your passion,” Burwell started. She relayed her own experience of finding meaning in her work, which allowed her to withstand the obstacles because once she fell in love with her work, she did not mind how difficult it might be. Collins recommended that the students start building on their interests early and seek a mentor. Both Burwell and Collins answered the question by supporting each other’s complementary belief that passion was what enabled both of the speakers to enter and excel in their respective fields despite the challenges and trials.